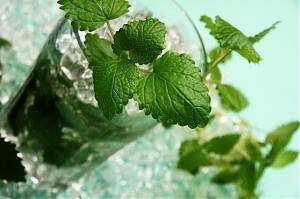 Place the mint leaves in a mojito (tall) glass and pour the lime juice over it (or squeeze a fresh lime, if available). Add the sugar. Press the sugar against the mint leaves with the back of a spoon repeatedly until the sugar dissolves. Add the rum and ice and shake the drink. Top with club soda, garnish with mint and serve. On 8 long skewers, thread chicken, plantains and chunks of red onion. Rub with jerk seasoning and cumin. Place on grill or under broiler and cook, turning once, about 6 minutes per side or until chicken is firm and cooked throughout and plantains and onions are tender. In a food processor, combine ingredients. Mix until smooth. In saucepan, bring sauce to a boil. Reduce heat and cook for 2 to 3 minutes, stirring frequently. Keep hot (about 140F). Combine all ingredients Pour marinade over 4-5 lbs. pork, turning evenly to coat. Refrigerate overnight at 40F or below. For Pork Tenderloin: Grill: Place tenderloin on a preheated 350F grill. Cook for 5 to 7 minutes on each side until a minimum internal temperature of 155F is achieved. Roast: Place tenderloin on rack. Cook in a 375F oven for 35 minutes or until a minimum internal temperature of 155F is achieved. Slice pork tenderloin and ladle on Floribbean Mojo Sauce. Flavors and ingredients from Florida and the Caribbean converge in this impressive entrée. The delicate spicy sweetness of the jam balances the fish's crisp coating of coconut and cashews. To prepare jam, combine first 3 ingredients in a food processor; process until smooth. Combine water, sugar, red wine vinegar, and dash of salt in a small saucepan over medium-high heat. Cook until sugar dissolves, stirring frequently. Reduce heat to medium. Add pureed bell pepper mixture; cook 7 minutes or until thickened and reduced to 1/2 cup, stirring frequently. Remove from heat; stir in lime juice. Cool. To prepare grouper, place the panko, coconut, and cashews in food processor; pulse 4 times or until cashews are finely chopped. Place panko mixture in a shallow dish. Place flour in another shallow dish; place egg whites in another shallow dish. Sprinkle fillets with 1/8 teaspoon salt and black pepper. Dredge 1 fillet in flour. Dip fillet into egg whites; dredge in panko mixture, gently pressing coating onto fillet to adhere. Repeat procedure with remaining fillet, flour, egg whites, and panko mixture. Add fillets; cook 2 minutes or until lightly browned on bottom. Turn fillets over; wrap handle of pan with foil. Place pan in oven; bake at 350° for 8 minutes or until fish flakes easily when tested with a fork. Serve immediately with jam and lime wedges, if desired. Wow that was unusual. I just wrote an incredibly long comment but after I clicked submit my comment didn't appear. Grrrr. well I'm not writing all that over again. Anyway, just wanted to say fantastic blog!